Similar to occupied territories in the Middle East, our communities are portrayed as semi-civilized and simply unable to exist without the heavy hand of the state. However, while some describe our barrios as “lawless, uncontrollable, and violent,” these words best describe the organizations that terrorize our neighborhoods under the banner of “Protecting Our Community With Exceptional Service”: the Oxnard Police Department. Now, the same organization that routinely abuses its power is leading “marches for peace” through the same neighborhood it harasses on a daily basis. How can so-called “community leaders” ask residents in good faith to join with the same group that still has the fresh blood of innocent people on its hands? In 2012, OPD actions claimed the lives of four Oxnard residents within half a year. The perpetrators of these extrajudicial homicides remain at large and most remain employed by the City of Oxnard. Robert Ramirez died in OPD custody in what the County Medical Examiner determined to be “Asphyxia from Active Prone Restraint.” However, on November 22nd of this year, the District Attorney of the County of Ventura hired a separate pathologist that predictably cleared the officers of any wrongdoing. Meanwhile, the people of Oxnard await the results of the DA’s investigation into the executions of alleged shooter Jose Zepeda and non-involved bystander, Alfonso Limon Jr. Many residents of La Colonia know from firsthand experience that the threat of unjustified police violence is very real. In mid-November, a video was posted on the Internet showing OPD Officer Moses Martinez committing an act of unreasonable aggression, breaking the law by attempting to detain someone for the “crime” of filming an arrest of residents in Eastwood Park. Although the incident is supposedly under investigation, it remains doubtful that Martinez will face any charges or disciplinary measures beyond an internal “write-up.” The same pattern is common among law enforcement agencies around the entire world: the internal investigators and District Attorneys routinely clear police officers for their crimes, while those charged nearly always walk free. In the case of Robert Ramirez, new experts are paid to come forward. No real justice can be expected when the same corrupt system that makes the rules breaks the rules. 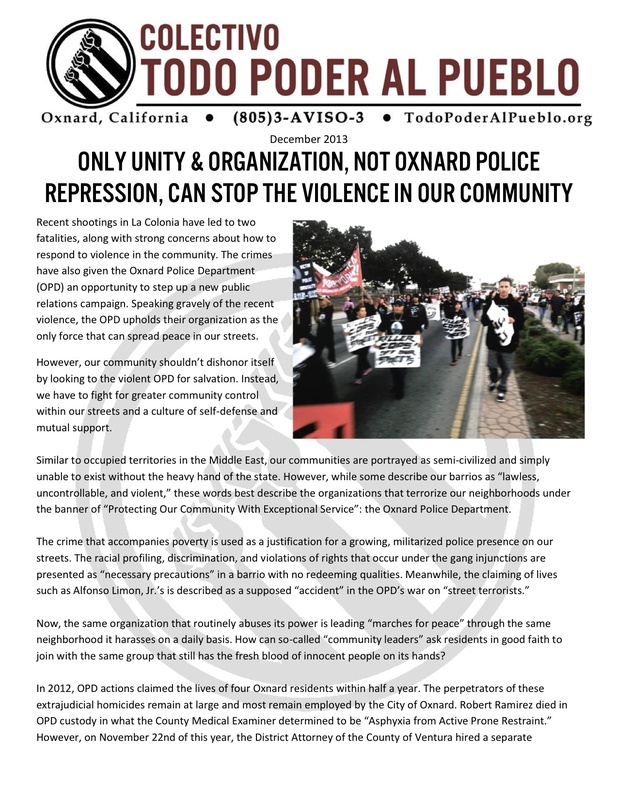 The OPD also uses force to silence the people of Oxnard: on the One Year Anniversary of the 10/13/12 fatal shooting of Alfonso Limon by OPD, protestors took to the streets of La Colonia to demand accountability and justice. In an attempt to intimidate the entire community and choke the voices of those who speak out against such abuses, the OPD filed several charges against one member of the group, Francisco “Chavo” Romero, supposedly to ensure “the safety of the general public.” Chief Jeri Williams of the Oxnard Police Department gladly hosts publicity stunts like “Coffee with the Chief,” where she doesn’t hear the hard facts about OPD, but she refuses to listen to the families whose loved ones’ lives were robbed by those under her command. We haven’t forgotten the deaths of Robert Ramirez, Michael Mahoney, Jose Zepeda, and Alfonso Limon, Jr. We won’t accept the city’s “solutions” of further militarizing our streets through an overwhelming presence of officers and proven killers who are accountable to no one. The Todo Poder Al Pueblo Collective is firmly against unnecessary violence in our hoods. We’re against the violent system of poverty that pushes our youth and our communities towards drugs, intra-communal violence (harming one another), and competing over basic resources. However, we also understand that turning to the police is a way of looking to the same institution that maintains the imbalance of power favoring the rich over our neighborhoods and struggling families. In the interests of our community’s overall health, we have to fight to bring these institutions under the control of Oxnard residents. True peace and public safety are only possible through our own efforts as a community. However, this will also involve the fight for a democratically-elected community review board with the power to hire, fire, investigate complaints, and effectively oversee the police. Violence can be fought through vocational, educational, and extracurricular programming for our youth, rather than incarcerations and arrests. Rather than looking to the police to secure “peace,” residents must organize to strengthen and build the power of the people, and the community itself.